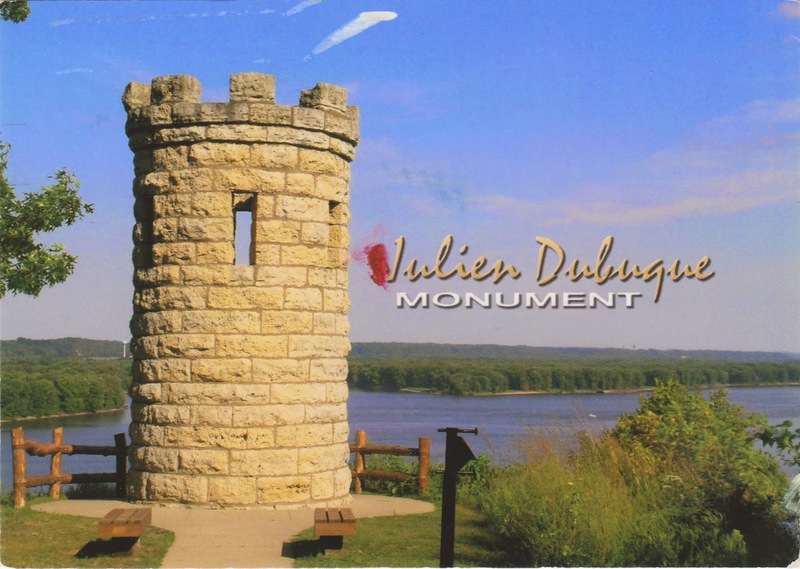 Postcard US-2566039 shows the Julien Dubuque Monument, final resting place of the founder of Dubuque, Iowa. 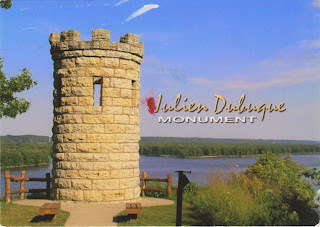 Julien Dubuque was a French Canadian from Champlain, Quebec, one of the first European men to settle in the area that is now known as Dubuque, Iowa. He initially received permission from the Meskwaki Indian tribe to mine the lead in 1788, eventually married Potosa, daughter of Peosta, the chief of the Mesquakie Indians. He subsequently submitted the claim to Spain since Spain controlled the territory prior to 1801. The Spanish approved a land grant for him in 1796. Julien died of pneumonia on March 24,1810, and was buried on the bluff above Catfish Creek. After his death, the Meskwaki built a log crypt for him, covering his grave with a wooden and stone shelter. In 1897, the structure was replaced by an imposing stone monument built of Galena limestone quarried from the bluff. The founder was buried four feet into the ground inside the monument. The final cost of the twelve-foot diameter, twenty-nine foot high Late-Gothic-Revival style structure was $560. The Monument was listed on National Register of Historic Places on November 21, 1988; it was declared a National Historic Landmark on November 4, 1993.